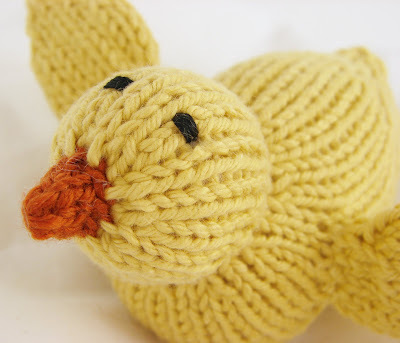 Auntie Em's Studio: Chicks for spring! I finally finished editing my little chicks pattern! I've probably made about twenty of them so far. I also had some wonderful test knitters on Ravelry test out the pattern, so I think that all of the kinks have been worked out and the pattern should be very clear and easy to follow. These make a wonderful quick knit and are lots of fun for spring. They would go wonderfully in an Easter basket or make lovely decoration. For the pattern visit Ravelry. If you are interested in buying some small chicks and you live in the Eugene/Springfield area, I have some (as well as a few other items) for sale at Glory Days Antiques through my friends at Colby Cottage. 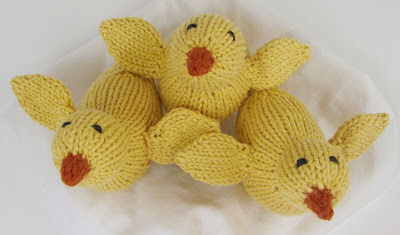 They have been quite popular and I've been knitting like crazy to keep up with the demand. There is also a slightly bigger one (an earlier version) for sale in my etsy shop and as always, feel free to send me a message on etsy to request items. Happy spring everyone!